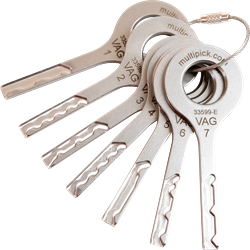 We now offer our most successful laser track key set in a stainless steel version. The new keys were cut from a one-piece solid material and enhanced by a mass finishing process. Further, the tracks were CNC-milled to ensure a much longer durability of the individual simulator keys. The set is suitable for car brands: VW, Audi, Seat, Skoda, Ford (Galaxy), Porsche (Boxter etc.). Key "7" is to be operated mutually (two differently milled tracks) and is designed for vehicles later than model year 2010. In combination with the keys "6" and "7" vehicles can be opened at least up to model year 2014.